I just realized over the weekend that I forgot to announce the winner of the Simon Says Stamp July 2015 Card Kit. Congrats! Please email me via the email button on my sidebar with your mailing info and I'll pass it on to Simon. 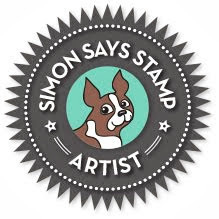 Just a reminder that you can pick up the Simon Says Stamp July 2015 Card Kit for just $29.95 + shipping. If you'd like to receive this kit and future kits for only $24.95 + shipping per month, you can SUBSCRIBE HERE. Thanks everyone for popping by! I hope you have a great day! I'll have another card to share later this week. 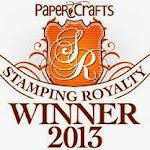 Simon Says Stamp Sail Away With Me (and GIVEAWAY)! 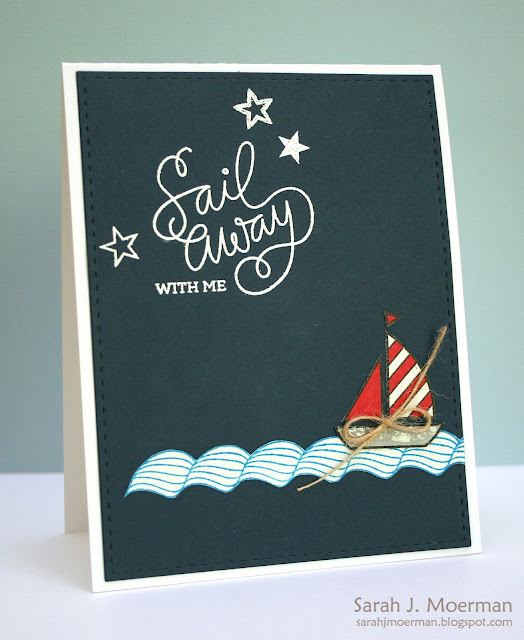 I'm stopping by to share a final card made using the Simon Says Stamp July 2015 Card Kit: Sail Away With Me. You can pick up the Simon Says Stamp July 2015 Card Kit for just $29.95 + shipping. If you'd like to receive this kit and future kits for only $24.95 + shipping per month, you can SUBSCRIBE HERE. Also, sweet Heidi, owner of Simon Says Stamp, has given me an extra July Card Kit to pass on to one of you! Just leave a comment on any or all of my July Card Kit blog posts and I'll announce a winner this Friday, June 26th. 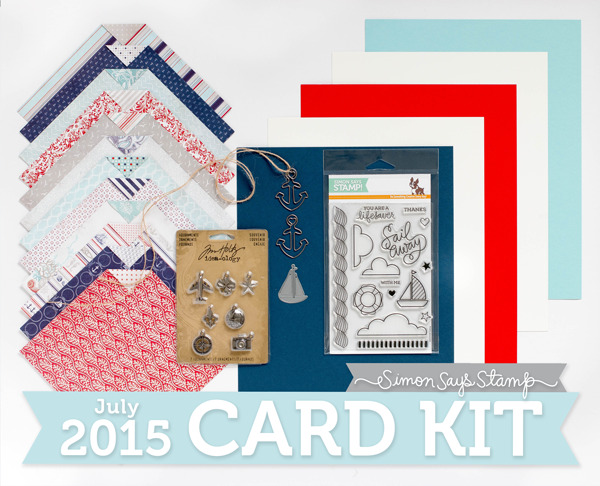 Simon Says Stamp July 2015 Card Kit - Lifesaver Card and GIVEAWAY! I hope your week has been going well. Mine's been a little crazy with a 35 hour whirl wind trip to Montreal with my sister to watch the Canadians and Netherlands women's FIFA soccer game. I'm Canadian with Dutch roots and wasn't sure who I wanted to win so I was happy with the tied game. ;) Yesterday was dentist appointments. Today my kids play soccer (if the thunderstorms hold out) and I'm bring dinner to my sister's place where my parents will be spending the night as they move an hour closer to us today/tomorrow. Tomorrow we have a wedding to attend and Saturday are expecting a visit from my sister-in-law and her family. Busy, busy. If you missed my first post HERE IT IS. I didn't use the sailing theme at all for that card but promised to do so later this week. So here I am! I was inspired by the Authentique Seaside patterned paper with the seashells and coral sitting at the bottom of the ocean. 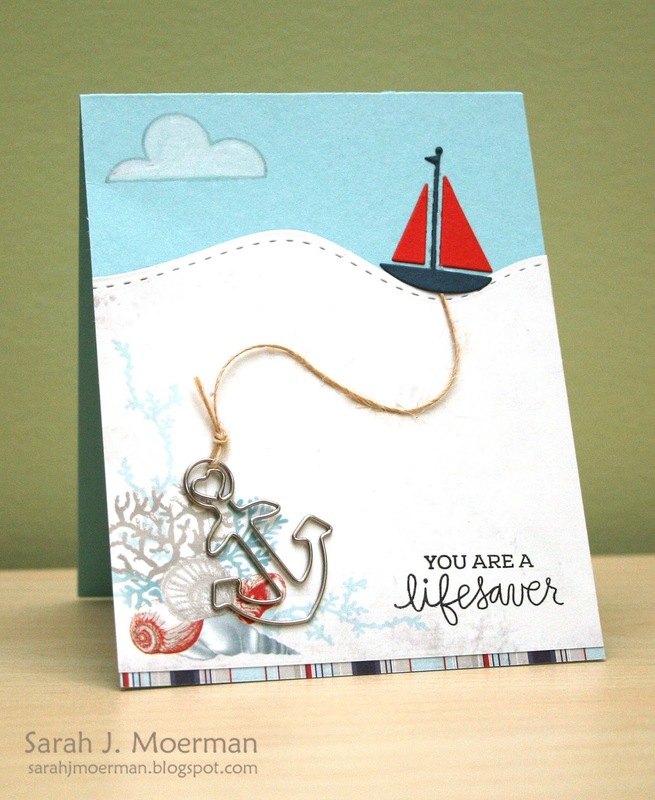 I thought it would be the perfect place for my Simon Says Stamp die cut sailboat to drop a Maya Road anchor (held together by some of the May Arts Natural Twine that also came in July's kit). The wavy seas were created with the help of Simon's Stitched Slopes and Hills Dies. I finished things off with a stamped cloud and sentiment from Simon's new Sailing Stamp Set. Also, sweet Heidi, owner of Simon Says Stamp, has given me an extra July Card Kit to pass on to one of you! Just leave a comment on any or all of my July Card Kit blog posts and I'll announce a winner Friday, June 26th.